Popular Mechanics has given Engineering prof Vijay Kumar, along with his colleagues and students, an annual Breakthrough Award for their work on flying robot swarms! In the future the first responders for many disasters could include flying robots, sent in to map dangerously compromised buildings. 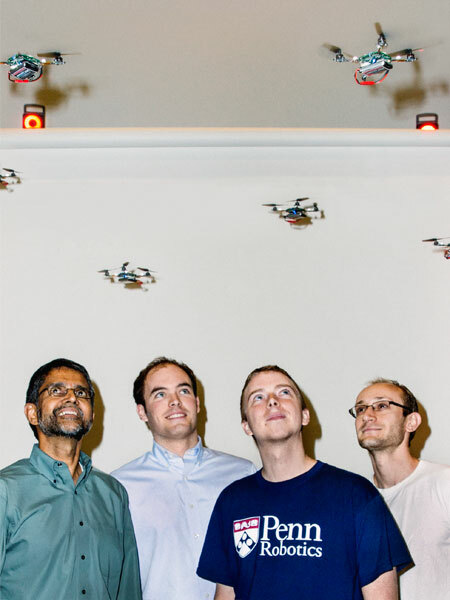 A team of engineers, led by the University of Pennsylvania's Vijay Kumar, is developing autonomously flying nano quadrotors that can fly in squadrons and pull off incredible tasks. They can spontaneously create maps or assemble a miniature truss structure out of a kit of parts. Each quadrotor has an onboard mobile processor and sensors for gauging how to move through the air while also accounting for obstacles and wind, plus a short-range wireless antenna for communicating with other drones. Those capabilities help the drones weave figure-eight patterns in the air and stream through windows without crashing. The long-term applications include construction and environmental monitoring.